In order to use services with a mobile app, the Mobile App associated with the app must be bound to services. To show the list of services, go to the application Overview screen and to the Mobile Services tab. There is a list of services available to be bound to the Mobile App and list of services that have already been bound to the client. Some services might support multiple binding and in that case a Bind to App button is also shown in a Bound Services row. The Mobile Services tab in the Mobile App view shows the provisioned services that are available to be bound to the Mobile App. 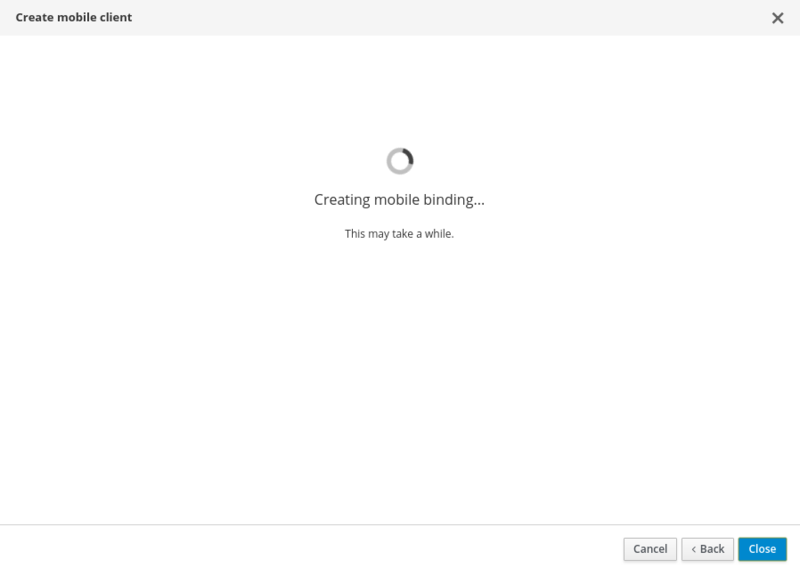 If a service has not yet been bound to a Mobile App, a binding can be created by selecting the Create Binding button. You can bind a service by clicking Bind to App (image is the example of a Push Service). 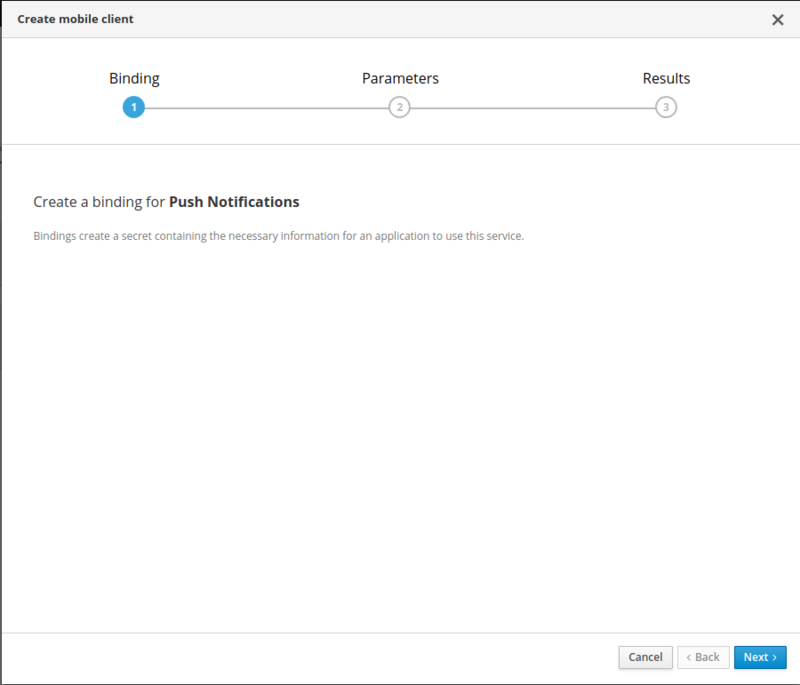 At the second step you can fill in configuration details for the binding (image is the example of a Push Service). Press Create to create the binding (image is the example of a Push Service). Note: You can safely close the dialog, everything is processed in the background. 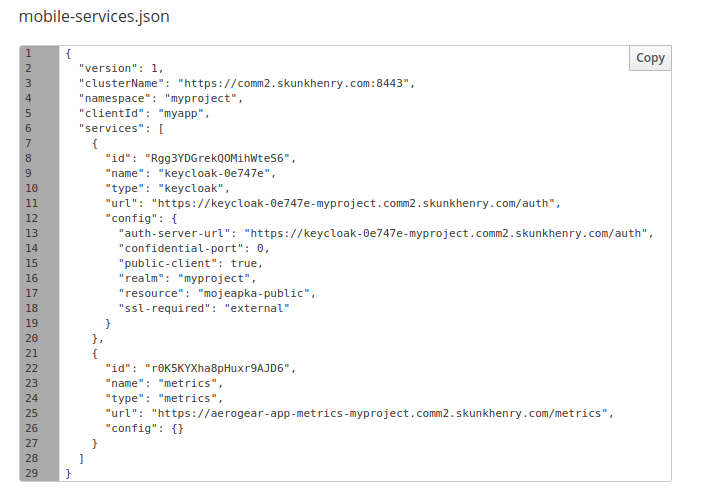 After the binding is complete, the configuration in mobile-services.json for the Mobile App is updated in the Configuration tab. This configuration is used by your app to interact with the bound services. It’s most usual to have only one binding per service in the application but in some cases it’s possible to create multiple bindings. There will be Bind to App button on the already bound service. The process for binding is the same. To remove the binding press the button and select Delete. If there are multiple bindings for the service there will be more options for the deletion. The Builds tab in the Mobile App view allows you to view the previous builds of the app, and triggers a new build of the app. In order to build the Mobile App app, you first need to provision a Mobile CI/CD service. If the service is not provisioned, use the link provided on the screen to browse all the available mobile services and provision a new Mobile CI/CD service. For more details about how to provision the Mobile CI/CD service, please see Mobile CI/CD service guide. 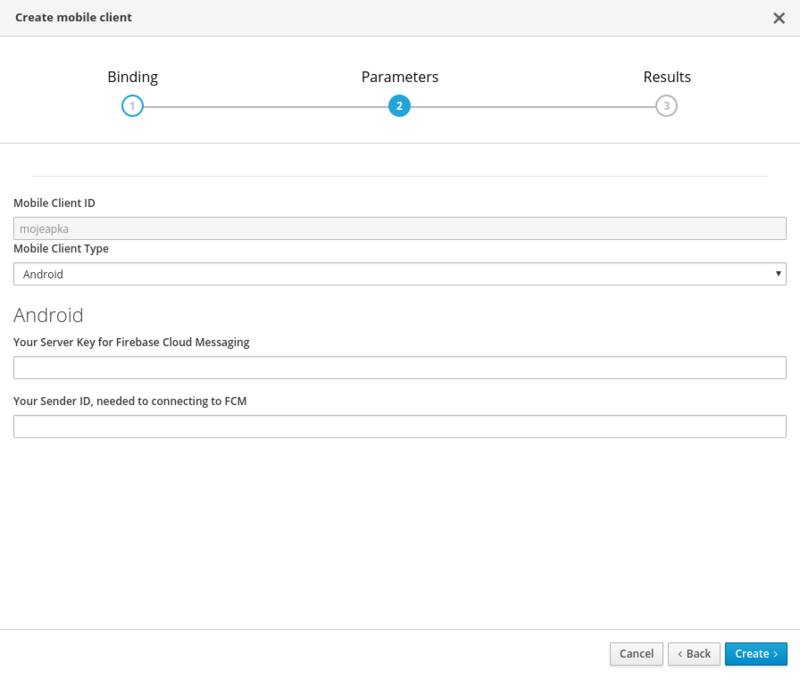 After the Mobile CI/CD service is provisioned, you need to create a new build config for the Mobile App. You need to provide more information about the mobile app here depending on the platform. For example, the repo of the source code, the type of the build, the keys used to sign the app, etc. For more information about how to configure the build config, please see the build config section of Mobile CI/CD. Once a build is configured, you can start a new build. You will be able to view the progress of the build from the OpenShift UI and access the full build log. Once the build has completed you can then press the Download button and you will be presented with a QR code. Applications to scan QR codes are available in Google Play for Android or the App Store for iPhone. Once the QR code has been scanned, it will open the download URL in the device and the application will download. If you do not have a QR code scanner you can also download the artifact from the URL in the OpenShift web console. Once downloaded connect a device to your local machine. For iOS applications open XCode and navigate to Window > Devices and Simulators. Here you can install your mobile application by pressing + button at the bottom, then choose your download IPA file for installation. For Android applications move the APK file into the device directory. On your device locate and select the APK file and select install. You may need to enable the installation of apps from unknown sources on Android devices before installing from an APK. After you have registered a Mobile App, bound the Mobile App to a mobile service, and downloaded the mobile services configuration file, you can start developing your mobile app using mobile services. Android: SDK is hosted on jCenter. iOS: SDK is hosted on CocoaPods. Cordova: SDK is hosted on npm. Xamarin: SDK is hosted on NuGet. For information about how to develop Android apps, see Android Documentation. In the build.gradle file of your app you can begin adding dependencies provided by the SDK. To implement certificate pinning in the individual SDKs, see Certificate Pinning in Android Devices. For information about how to develop iOS apps, see iOS Documentation. In your project directory (the directory where your .xcodeproj file is), create a plain text file named Podfile (without any file extension) and add the lines below. Replace YourTarget with your actual target name. Open up .xcworkspace with Xcode and start using the SDK. Do not use .xcodeproj. If you open a project file instead of a workspace, dependencies will not be correctly configured. For information about how to develop apps using Cordova, see Cordova Documentation. Open a terminal and navigate to your appplication project root folder. For information about how to develop apps using Xamarin see Xamarin Documentation. SDKs for our Mobile Services are available for a variety of platforms, including Android, iOS, Cordova & Xamarin. These SDKs will help simplify your mobile and modern application development needs, leveraging OpenShift’s Container technology to provide a secure, scalable backend platform.